PPAHS encourages the adoption of the Anesthesia Patient Safety Foundation (APSF) recently released recommendations to improve the safety of patients by continuously monitoring patients following surgery. According to the HealthGrades study of patient safety in American hospitals, “failure to rescue” and postoperative respiratory failure (also known as “Code Blue”) are the first and third most common patient safety related adverse events affecting Medicare patients accounting for 113 events per 1,000 at-risk patient admissions. “These adverse events which affect both Medicare and non-Medicare patients result in death or anoxic brain injury in the majority of cases,” observes Dr. Daniel Sessler, who is Professor and Chair of the Department of Outcomes Research at the Cleveland Clinic, and Director of the Outcomes Research Consortium which is anesthesia’s largest academic research organization. The Consortium conducts research in anesthesia, critical care, and comprehensive pain management. A capnograph is a monitoring device that measures the concentration of carbon dioxide” that a person breathes out in exhaled air and displays on a numerical readout and waveform tracing; and a pulse oximeter is a device for measuring the amount of oxygen in blood. To improve patient safety and health outcomes, the Anesthesia Patient Safety Foundation recently released recommendations calling for continuous electronic monitoring of oxygenation and ventilation. How monitoring is currently conducted on postoperative patients may not be enough. As the APSF recommendations state, “Intermittent ‘spot checks’ of oxygenation (pulse oximetry) and ventilation (nursing assessment) are not adequate for reliably recognizing clinically significant evolving drug-induced respiratory depression in the postoperative period.” In other words, better monitoring for patient safety is needed and APSF recommends that use of current technology to improve patient safety. Just ask Carly Ann Pritchard who suffered an ankle injury and then underwent surgery to reduce lingering pain from her ankle injury. Unfortunately, although she survived surgery, she suffered brain damage because of an accidental overdose from a morphine-filled pain pump — after surgery. A California appeals court recently upheld a jury’s award of about $9.9 million in damages. 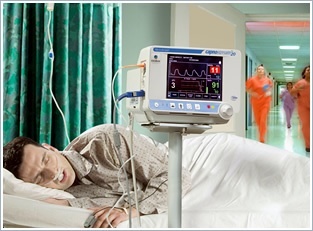 Moreover, as the APSF guidelines provide, using capnography and oximetry monitoring on all postoperative patients is recommended, and not just for patients who may have an obvious increased risk of postoperative respiratory insufficiency (such as those with obstructive sleep apnea, obesity, or chronic opioid therapy). Observes Dr. Frank Overdyk (Professor of Anesthesiology and Perioperative Medicine at the Medical University of South Carolina), “Serious postoperative adverse events such as deaths and anoxic brain injuries due to opioid acute pain management are a significant and preventable threat to patients, for which all institutions and healthcare providers must have zero tolerance”. However, waiting for future technology to manage this issue is not acceptable. As Dr Stoelting explains, “Future technology developments may improve the ability to more effectively utilize continuous electronic monitoring of oxygenation and ventilation in the postoperative period. However, maintaining the status quo while awaiting newer technology is not acceptable” [Dr Stoelting’s emphasis]. I beleive the most recent APSF guidelines do not specificaly mention use of capnography Rather, they recommend monitoring of oxygenation and ventilation. If these patients are at significant risk, they need to go to an advanced nursing floor (i.e. sleep apnea, outlandish narcotic consumptions. This is the age of the outpatient surgery and we sure are not providing for any monitoring at home. Moder anesthetics are transient by their very nature these days and are eliminated prior to discharge from the PACU. Regional anesthetics provide relief without narcotics. TO state that everyone who goes to a nursing floor will need monitoring is simply nonsense. These things alarm inappropriately, are out of sight/touch/hearing of nurses and like so many IV pump would simply be more alarm noise in the hospitals with no one listening becayse they are alarms going off without any patient consequence! The problem will be monitors alarming because they are not on the patients, not answered by the nurses, etc! If a therapy is used that requires specific nursing observation-send them to the units! For this exact reason at my institution the use of spinal and epidural morrphine is not done. The above article reports of a “pump malfunction” as the cause of a patient injury. This has more to do with equipment/personnel errors than any need to monitor routine patients for expected side effects. The cost of a PACU monitor for every patient while in the hospital would be excessive and unlikely to be helpful as false alarm rates would be excessive and detract from catching any “real alarms”. I do not see it indicated as a “pump malfunction” but an accidental overdose which could be caused by improper titration of the drug or from too high a bolus or frequency of the PCA setting. Anytime a monitor senses a low RR, high or low ETCO2, or the lack of breathing it is a “real alarm” and typically preceeds HR, PR, and SpO2 alarms by seconds to minutes; especially if the pt is on supplemental O2. Additionally, the $9.9 million per person to any number of people per 1000 would seem to cover a substantial number of monitors for years to come. Geana – Great reminder that technology alone is not the answer. It is the combination of skilled, trained clinicians using great technology that improve patient safety and outcomes. To download a checkable version of the OB/GYN VTE Safety Recommendations click here. To download a regular version of the Safety Recommendations click here. Learn more about the VTE Safety Recommendations working group. To download a free copy of the First National Survey on Patient-Controlled Analgesia Practices, please click here. To download a word copy of the PCA Safety Checklist, please click here . For a pdf of the PCA Safety Checklist, please click here . Looking for an Expert Quote? We've collected several opinions from patient safety experts and have aggregated some of the best of them here. Need help determining if a patient experiences obstructive sleep apnea and is therefore at risk of opioid-induced sedation and respiratory depression? (c) Is in keeping with previous posts on PPAHS. Physician-Patient Alliance for Health & Safety (PPAHS) is an advocacy group dedicated to improving patient health and safety. PPAHS seeks to advance key patient health and safety initiatives that significantly impact patient lives and to do so in a prescriptive and practical manner. PPAHS is engaged in the following key initiatives for improving patient safety and health outcomes: opioid safety, venous thromboembolism, and alarm management.